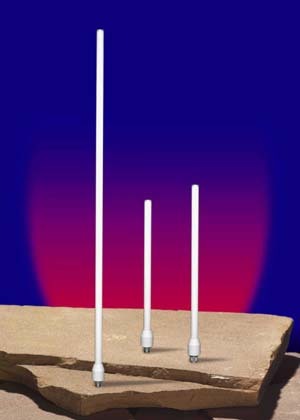 Hirschmanng, lightweight antennas are for use in the low power ISM band. They provide good gain and coverage characteristics at a moderate cost. The E-5030 series offers the system operator a choice of gain to accommodate a variety of requirements and situations. Each is a collinear design fabricated from the latest of low loss microwave dielectric materials and pure copper radiating elements. Models are available with both N-male and -female connectors to allow for direct connection to system equipment, thus avoiding feed line losses. The E-5030 Series has been designed to provide low side lobes and each model has been optimized for aperture efficiency. Each antenna is packaged in a white, UV resistant radome. Other frequency ranges can be provided. , 30 Hook Mountain Rd., Pine Brook, NJ 07058. Phone: 973-830-2000; Fax: 973-830-1471.